Garcia, a Mestizo born in southern Colorado in 1947, considered becoming a Mormon because of Mormons' racial tolerance. With even less consideration, he joined the Army in the early days of the Vietnam War and became an Airborne Ranger infantryman, ending with ugly wounds and a buck sergeant's stripes. Here Garcia offers a classic portrait of a reluctant, or""accidental"" soldier who mastered the art of the infantryman in the""scorching, sordid jungle theater."" He offers additional portraits of respected comrades in arms, such as Sergeant Holyfield at Fort Benning and the too-soon killed Captain Ivy, and vividly depicts infantry combat (including killing a woman guerrilla). 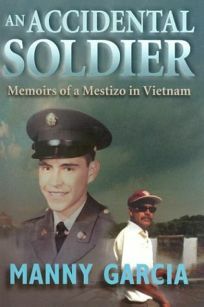 His postwar career led him to one failed and one successful marriage, a law degree, a career as a criminal defense attorney and this distinctive Vietnam memoir.